Wenzhou is a coastal city belongs to Zhejiang province; as it is one of the biggest economic centers. The south neighbors to Fujian province and north to Taizhou. Wenzhou, the developed modern city has to trance back to Dongjin dynasty (323 AD), the historical water transportation center of Zhengjiang was located there, so that the geographical advantageencourage the local business men export the tea and silk to overseas from the port. Wenzhou is located in a subtropical marine monsoon zone. The temperature is quite soft with four distinct seasons. The annual average temperature is 16.1 to 18.2 degrees Centigrade. Wenzhou is the major national hub port for highway, waterway and aviation. Wenzhou Highway is runs through Lishui, Jinhua Jinliwen highway, and leading to Ningbo, Taizhou and Ningbo-Taizhou-Wenzhou Expressway. On February 3, 2010 Wenzhou was completed Zhu Yong Expressway, which is start from Zhuji and end to Yongjia. And another beltway’s completions will helps the driving more convenient. Wenzhou international airport has flights to the major cities in mainland China-Beijing,Fujian and Shanghai. The direct international flight is goes to Hong Kong. Wenzhou port is one of the largest coastal container terminals in China. Jingwen highway is the first railway in Wenzhou, and then the two rail motor car set-Wenfu highway and Yongtai Highway was completed by the end of 2009. Wenzhou has many star-grade hotels to provide a comfortable stay. Standing side by side with those up-market lodgings are these street guesthouses and hotel inns which may provide accommodations for really cheap price. There is a hotel to meet your need when you are traveling Wenzhou. The most popular Wenzhou food is for fried pancakes, Tangyuan and fish ball( which is use to boil in the hot pot). 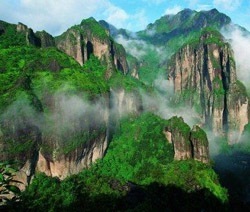 When in Wenzhou, check out Yandangshan Mountain (雁荡山), which is known as “the First Mountain in Southeast China”. Located in Yueqing Prefecture (乐清市), it is a volcano formed 100 million years ago. The area was listed as a World Geographic Park by UNESCO in 2005. It is 297 km from Hangzhou and 68 km from Wenzhou. Properly named North Yandangshan Mountain, yan means &apos;wild goose&apos; and dang means to &apos;swaying&apos;. There are many wild geese resting and numerous reeds swaying on the mountain all the year round, thus the mountain&apos;s name. Among the over 550 scenic spots on the mountain, the most famous and must-see attractions are Ling Peak (灵峰), Ling Cave (灵岩), and Dalongqiu Waterfall (大龙湫瀑布). The best months to visit are May, June, August, and September. You could go after a rainy day to enjoy the grand view of the waterfall with a drop of 200 meters. Even if you’ve seen all the famous waterfalls in China, you will regret going home without seeing this one. Don’t miss the amazing open air performance when visiting Ling Cave (10:30am and 3:30pm Monday–Thursday, 2pm and 4pm weekends). The night view of Ling Peak best presents the essence of Yandangshan Mountain. It is popular to include a visit to the nearby Nanxi River as a day trip at ￥300–500 by taxi. Nanji Island (南麂岛) is an island that is also called Haishan (&apos;Sea Mountain&apos;) with numerous reefs around. It belongs to Pingyang County of Wenzhou Prefecture, 50 nautical miles from downtown Wenzhou. The silver sand of the beach makes the island a nice outdoor sun bathing area. Besides visiting caves and temples on the island, you can get a glimpse of what daily life looked like for the first Lady of the Republic of China, Meiling Song. The island has a glorious past, which is the pride of local islanders. In the early Qing Dynasty (1644–1911) Chenggong Zheng, a very famous national hero in the Ming Dynasty (1368–1644), often took troops training on the island, preparing for resisting the government of the Qing Dynasty. An emperor of the Ming Dynasty conferred him the surname Zhu, which was the country surname at the time. Some tourist spots today are named &apos;Country Surname Mountain&apos; (国姓山), &apos;Country Surname Temple&apos; (国姓庙), and so on.